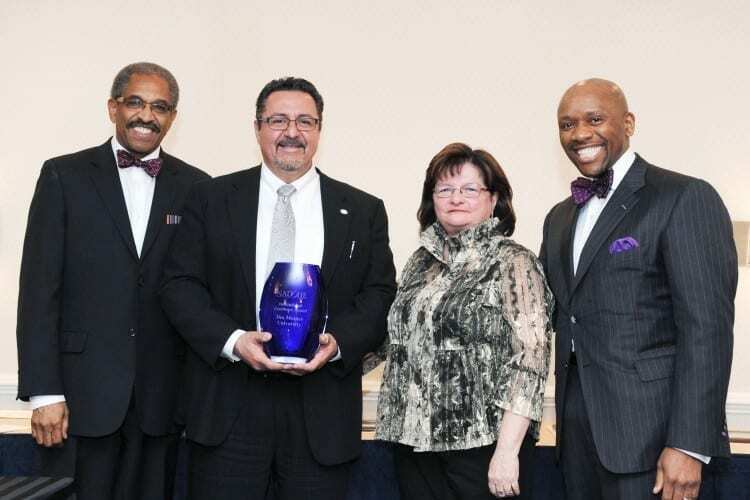 The National Association of Diversity Officers in Higher Education (NADOHE) has selected Des Moines University (DMU) as the recipient of its Institutional Excellence Award for 2015. The award is given annually to a college or university that has demonstrated measurable progress in promoting and sustaining innovative diversity efforts within its campus community. DMU will receive the award at a reception during the NADOHE annual conference on March 17 in Washington, DC. Since its founding in 1898, DMU has emphasized respect for all persons, meeting the health needs of the underserved populations, and giving students opportunities to learn from and work with those of different backgrounds. The University’s three colleges offer nine graduate-level professional degree programs in medicine and the health sciences. In recent years, DMU has established a new Office of Multicultural Affairs; incorporated cultural literacy content into curricula; and expanded programming to enhance cultural competency of students and employees. In addition, in 2011 the University revised its mission, vision and values to reflect its commitment to educating diverse groups of highly competent and compassionate health professionals.